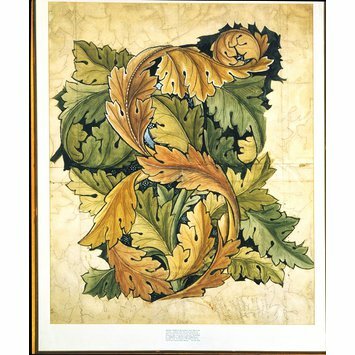 This is an original design made by Morris in the process of working out the repeat and the colouring for the 'Acanthus' wallpaper which was produced in 1875. It is a working drawing, on the same scale as the finished wallpaper, but it does not show the whole pattern. It was intended as a guide for the printer to use when matching the colours. Pencil notes with instructions and questions about the colours have been added to the drawing by the printer. In the mid-1870s Morris moved away from his earlier style of small-scale patterns. 'Acanthus' was the first wallpaper in a group of large-scale heavy patterns printed in darker colours. These designs were more sophisticated than the earlier papers, and Morris successfully disguised the underlying geometric structure of the repeat. Some of the features of the drawing, such as the white highlights on the scrolling leaf at the top, were left out of the printed version of the pattern. The outlines were drawn in pencil and then filled in with watercolours. Morris then used an opaque white pigment to paint in the highlights. The stylised scrolling acanthus leaves were some of Morris's favourite motifs and occur regularly in his work, including his tapestries and his illuminated manuscripts. Design for 'Acanthus' wallpaper, a pattern of acanthus scrolls; Largely worked in watercolour. 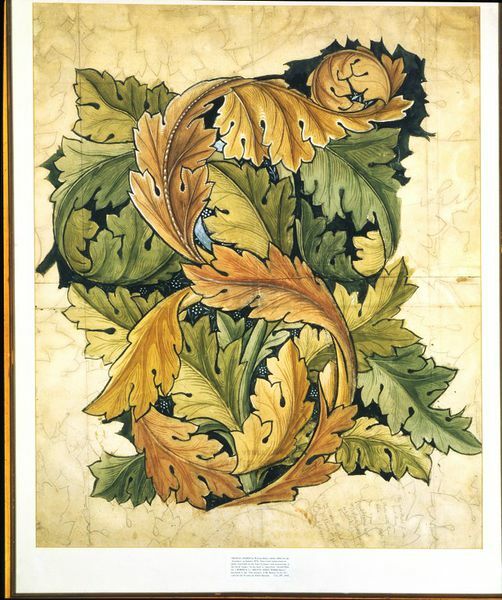 Design for 'Acanthus' wallpaper, a pattern of acanthus scrolls; Largely worked in watercolour; By William Morris; England; 1874. Parry, Linda, ed. William Morris London : Philip Wilson in association with the Victoria and Albert Museum, 1996. Published to coincide with an exhibition at the Victoria and Albert Museum, 9 May-1 Sept. 1996, pp.212, 213, ill.
Joanne Parker & Corinna Wagner, Art & soul : Victorians and the gothic, Bristol : Sansom & Co., 2014. ISBN: 9781908326652.